What Is the Big Cat Rescue? Rescue exotic cats from harmful environments (i.e. private ownership, circus wagons, etc.). Rehabilitate rescued or injured cats and house them in a spacious, caring sanctuary for the remainder of their lives. Educate and inform the world about big cats and their rights. 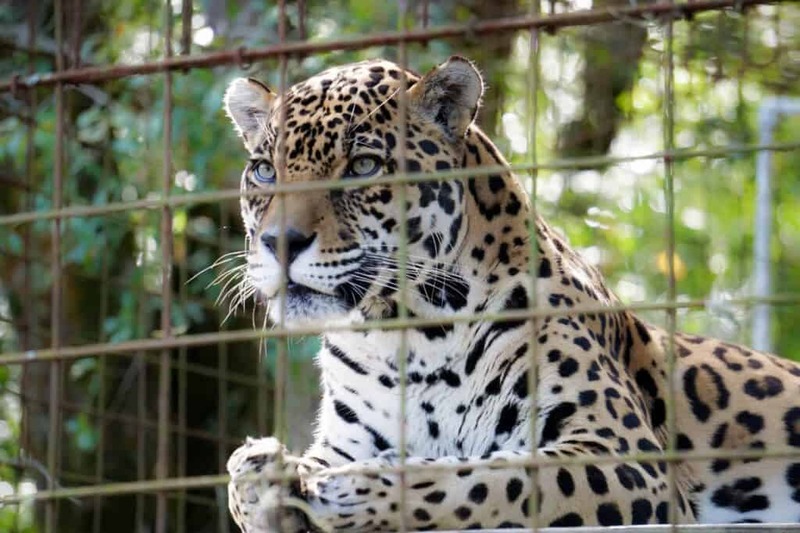 End the private trade of exotic cats. Advocate for the implementation of legislation that would protect exotic cats from private ownership across the 50 US states. At the Big Cat Rescue, there are approximately 15 paid staff members and roughly 100 volunteers and interns. Interns can come (with boarding and stipend) to begin learning and working within the sanctuary. The sanctuary receives about 30,000 visitors annually. Big Cat Rescue’s ultimate dream is to “go out of business” because that would mean there’s no longer a need to rescue exotic cats from the private trade. The Big Cat Rescue firmly remains, and will always remain, a non-profit educational sanctuary. Financially, the sanctuary relies on donations, ticket sales, merchandise sales from their shop, and sponsors. What Is NOT a Cat Sanctuary? Interact/touch/hold/pet/have your picture taken with the cat.  This is so important to remember! As explained by our guide at the Big Cat Rescue, a real sanctuary for exotic cats will NEVER allow you to pay to have your picture taken or to let you play with baby exotic cats, etc. The staff at Big Cat Rescue are no exception to that rule. They purposefully carry out their daily activities (feeding, cleaning cages, transferring from space to space, etc.) in a way that ensures no contact is made between the cats and humans. Cleaning staff cleans excrement daily with a 10-ft pole as most cats will poop always within 10ft of the borders of the fence. What IS a Cat Sanctuary? The GFAS is the only animal sanctuary accreditation program in the world. If you’re traveling and see a “sanctuary” or “rescue” and wish to check if they have accreditation, check the GFAS database which includes over 150+ organizations around the world.  Anyone can call themselves a rescue/sanctuary so it’s crucial to be extra aware of animal tourism when you travel. 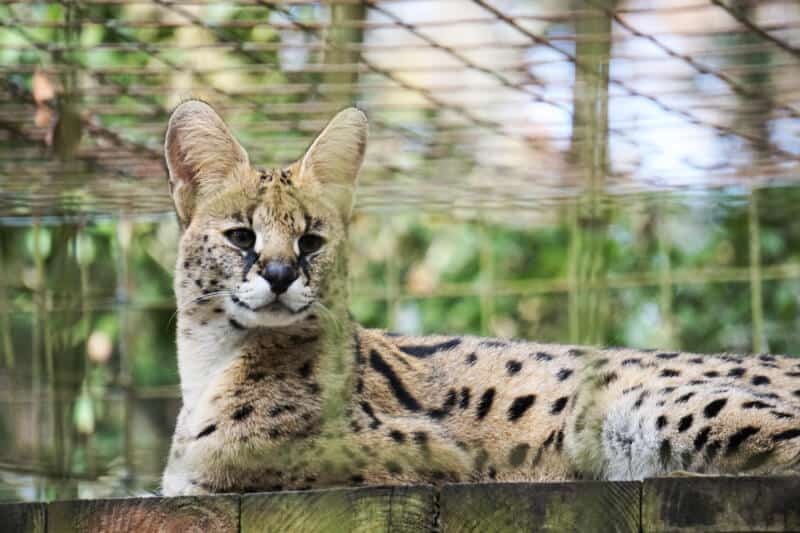 There are 70+ cats at the Big Cat Rescue (featuring bobcats, lynx, Canadian lynx, tigers, caracals, lioness, lions, jaguars, cougars, servals, savannah cats). Mary Anne & Max – Bobcats who met on Valentine’s Day and have been inseparable since. Seth – Largest tiger at BCR housed in 1 acre of land. Hoover – Tiger from Peru, bred in a traveling circus wagon. His first contact with water was confusing for him since he’d never been in it before. Reise – a 24 yr old cougar. 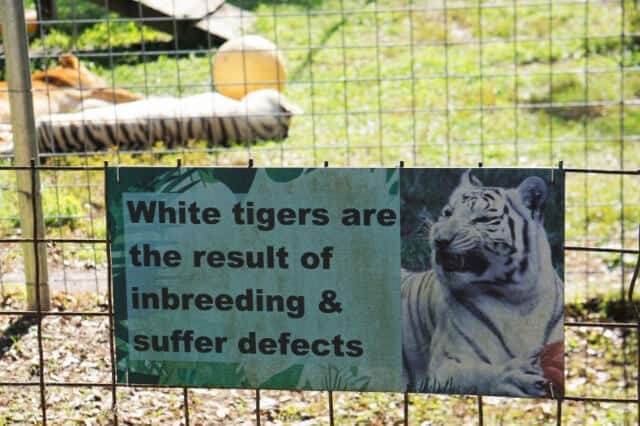 Zabu – White tiger (PSA:  White tigers DO NOT EXIST IN THE WILD, they are the product of constant inbreeding. As a result, they are born with massive deformities and health issues). Cameron – Neutered lion (Neutered lions lose their mane as manes are testosterone-driven). Watch Cameron & Zabu’s story below! Beacher – A sweet Savannah cat. Once brought in to the facility, the cats are taken care of for the remainder of their life until death. 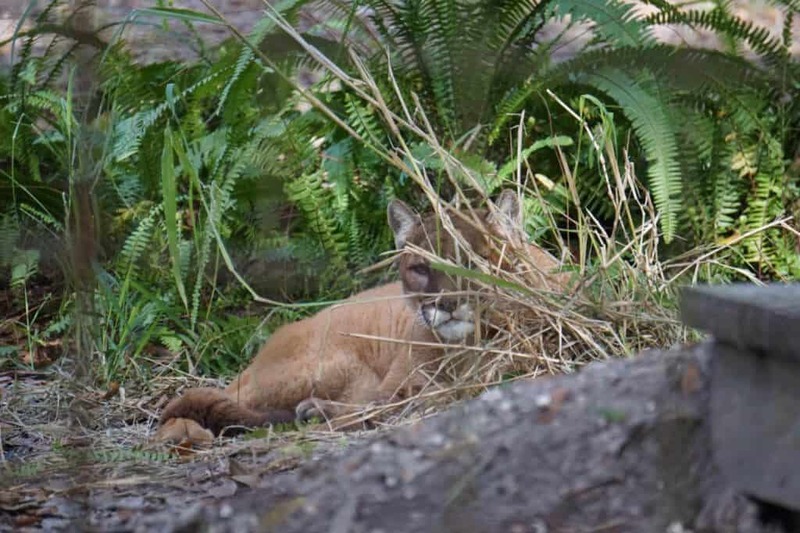 For instance, cats, like Reise (cougar), normally live 8-10 years in the wild. But Reise, believe it or not, just turned 24 years old which is in part due to her care since arriving at Big Cat Rescue in 2013. As a kitten, she was subjected to a botched declawing procedure which has encumbered her all her life. Some are rescued from travel wagons/circuses, some from private ownership, some from failing owner’s health, and some were from Serenity Springs (a fake sanctuary). As for their nutrition, the cats are fed a premium raw meat diet. Where do the cats receive medical care? The Big Cat Rescue has an on-site hospital for vet care. Sedation is avoided at all costs unless absolutely necessary (dental problems, tumors). Some cats were very sick and malnourished when they arrived. Some even had broken bones or tumors when they first came in. What do the cats live in? Each cat has their own outdoor space with shelters, which features at least two separate sections for each cat (many have more sections) in order to permit cleaning of one cage while the cat safely resides in the other section. The “cages” (more like outdoor lots) are uniquely adapted for the needs of the cat. The cage system also features collapsible underground tunnels which allow safe passage for cats when they rotate cages. The purpose of rotating their cages is to prevent boredom. In addition, BCR also provides an enrichment program for the cats, which includes various toys, a vacation in the “vacation pen” for 2 weeks, Christmas trees on Christmas, pumpkins on Halloween, etc! The enrichment program’s goal is to eradicate boredom since they are, after all, in captivity. 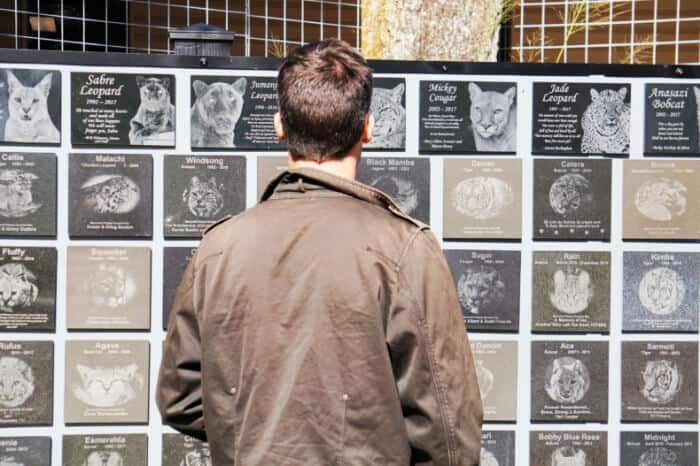 The BCR “memorial wall” dedicated to every cat who has passed away since arriving in BCR. Live cameras are installed for supporters to watch around the clock some of their favorite cats rest or play, like Hoover or Seth. Go to bigcatrescue.org/cams to watch them live right meow! The entire facility is solar-powered. There is also running water/pools/ponds for most cats. There are the more social cats on the tour trail, however, if cats stress/have anxiety about seeing people, they stay in the cages off the trail/in the back where there is less/no foot traffic. 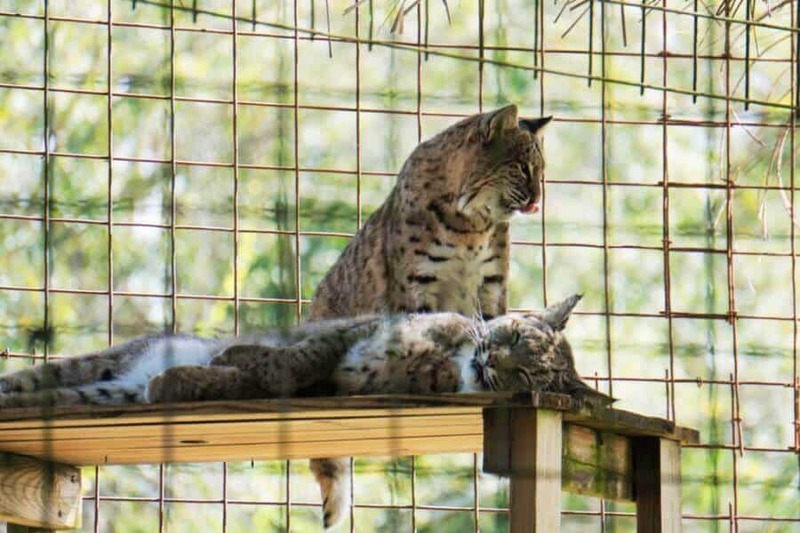 The facility also houses a rehabilitation center for wild Florida-native Bobcats (that are abandoned, injured, or sick). They do not have any contact with staff/humans at all, not even radio so that they stay wild and can be safely released back into wild/Florida. BCR also partners with the local humane society to foster baby kittens (on-site) until they are 2-lbs and then they go back to the shelter for adoption.  While it is technically illegal to own an exotic cat in most states, many people wiggle their way around the law by obtaining a USDA exhibitor license and claim the big cat(s) are not pets but are part of their own zoo. There is some legislation in place at the moment in many states to help protect big cats, but it’s a messy patchwork of laws that ultimately fail.  Exotic cats make terrible pets for a number of reasons (wild, unfriendly, messy, requires lots of space and a special diet, dangerous, will mark territory). Exotic cats are mainly bred in captivity for the circus/roadside zoos, and for private ownership. In most, if not all cases, they are subject to abuse on all accounts. Cameron & Zabu sleeping in the sun in the background.  White tigers do not exist in nature (they are bred with abnormal birth defects and illnesses).  Captive big cats could not survive on their own because they’ve never learned how to survive in the wild. Not only is it illegal to release non-native animals, but there is also no wild area in the US to release tigers, lions, jaguars and other non-native big cats.  The GFAS (Global Federation of Animal Sanctuaries) gives accreditation to approved rescues and sanctuaries. You can search for them in their database here. PLEASE do not pay tours or fake sanctuaries to touch or take your picture with these precious cats.  The United States is SLOW to recognize the rights of big cats. Peru has made a nation-wide ban on all ownership of exotic cats and is rehoming them to sanctuaries. 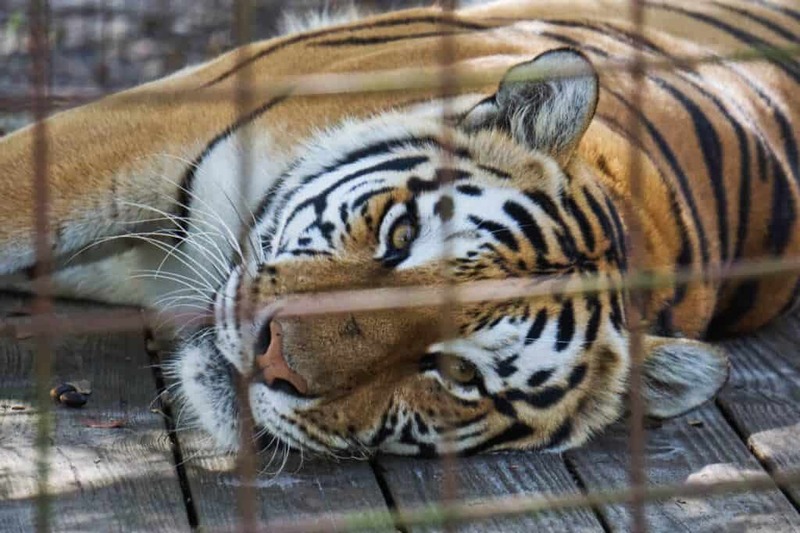 Please learn from organizations such as the Big Cat Rescue. They are fighting for big cat’s rights every day and are making a difference, but we need to be louder! When you travel, do not engage in activities or tours that feature captive animals. Be wary of zoos with ‘USDA-approved’ cage dimensions. Their wording is vague, making it impossible to be legally binding. This means zoos, so-called rescues or sanctuaries can actually keep a lion in a tiny cage for life, without punishment. 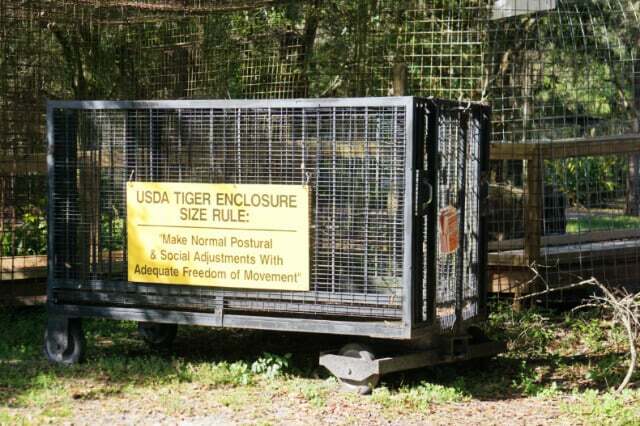 The state of Florida requires cages to be 10 X 24 sq ft, which is still super small to imprison a tiger or lion (or 2) for life.  The Big Cat Rescue has minimum 1,200 sq ft closed fences for small bobcats and up to 1 acre for larger cats, such as Seth the Tiger who weighs 500 lbs. The BCR vacation area for cats is 2 acres large. Big Cat Rescue invites you to do a guided tour of their awesome facility. You need to purchase your ticket online and choose a date and time. The Day Tour is 90 minutes. A Feeding Tour, Keeper Tour, Kids Tour, are also available.  First, call your US Senators and House of Representatives member to show solidarity for the Big Cat Public Safety Act. Big Cat Rescue has made this as easy as possible for you to do. Just visit BigCatAct.com and follow their steps. 女 Second, you can also help out by booking a tour and by shopping at the Big Cat Rescue shop.  Third, consider donating to the Big Cat Rescue if you are able to. Additionally, select the Big Cat Rescue as your organization of choice when you shop via AmazonSmile (Amazon will donate a portion of your purchase to the BCR at no extra cost to you). Why did we review the Big Cat Rescue? Paul and I were contacted by a representative of the BCR in 2016 when Cole & Marmalade (famous Insta kitties) co-launched a campaign with BCR, along with H3 Essentials, called “Little cats helping big cats”. Yoda was offered to review their special line of freeze-dried cat treats. We have been following along with the Big Cat Rescue ever since. 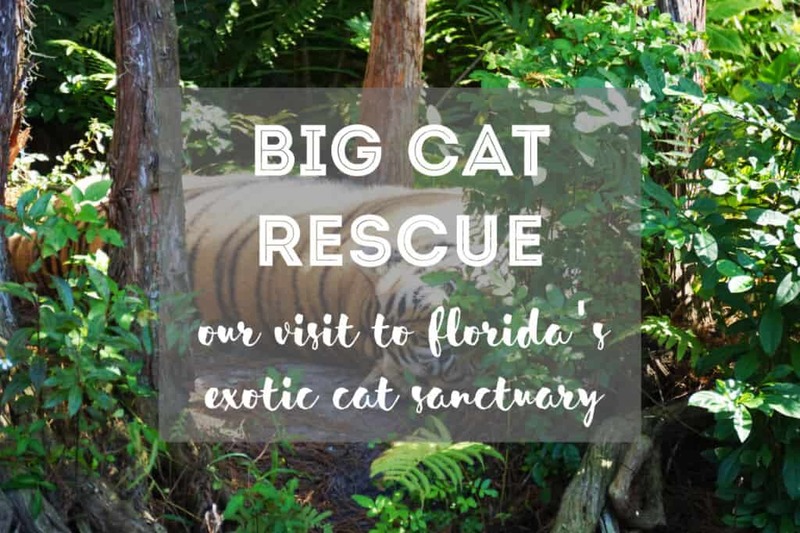 Therefore, when we knew we were going to be in Florida for two weeks in December visiting family, we reached out to Big Cat Rescue to see if we could take a tour and write a review. 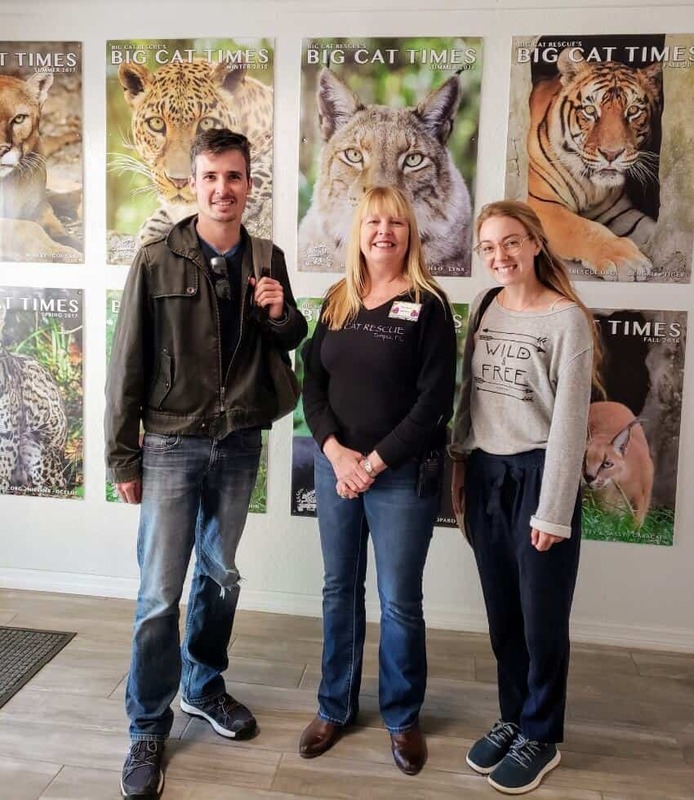 Above all, we loved our tour of the Big Cat Rescue, and we owe a big thanks to Susan for welcoming us and taking the time to share with us her shared passion for big cats. Lastly, if you are ever in the Tampa area, it is definitely worth booking a guided tour. You won’t regret it. If you go, say hi to our big kitty friends on our behalf!